You can view our Koh Chang map here. Want to learn more about Koh Chang? Why not check out our Eastern Thailand & Koh Chang Forum. 55 rooms with prices starting from 1,180 to 5,700baht per night. Room Rates from 788 to 2,214baht per night. The resort is set nicely near White Sand Beach , one of Koh Chang's beautiful beaches and in front the Mai Horm Mountain , the most beautiful mountain of the island. Baan Sansabai Resort is a perfect place surrounded with the peaceful natural environment where you can choose either the excitement of leisure activities or the enjoyment from a variety of Thai cuisine. The resort's spacious 6 bungalows are fully furnished in contemporary Thai modern style, which offer luxury, comfort, and convenience. All the rooms are air-conditioned, and have TV, mini-bar and private bathroom with hot-water-shower . Room Rates from 1,200 to 1,700baht per night. Next to the Ban Nuna Restaurant which serves Thai and German food, famous for his Pizzas. 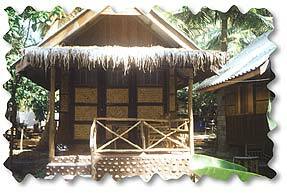 Basic Bamboo shacks with own bathroon start from 500baht per night. Room Rates from1,200 to 2,800baht per night. 1,800 to 6,900baht per night. Room Rates from 1,800 to 6,500baht per night. 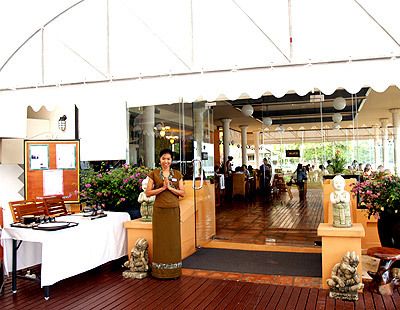 Baan Zen is the place to relax and rejuvenate, With yoga, various types of massage, meditation and reiki. 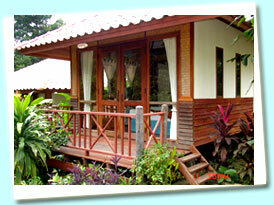 34 rooms and 30 bungalows, rooms start at 1,200baht and bungalows at 700baht per night. Set among lush tropical gardens, all of our 61 guest villas are endowed with ocean view terraces where guests can relax and enjoy peaceful sound of the rolling waves. The Beach Cafe is open to ocean breezes and the scent of tropical flowers the most suitable place for all day dining and also to enjoy an evening cocktail or soft drinks while watching the sun slowly setting into the ocean. The sound of the waves is musical background giving our guests an experience of dining by the sea .The restaurant also features very fresh grilled seafood and international cuisines. Two internet stations are provided for guest use from 7 am. - 11 pm. at a very minimal charge. A number of various sizes of safe deposit box are located near the reception counter for your convenience. Shuttle bus (to & from pier) services, laundry and dry cleaning, baby sitter, tour counter, swimming pool. Beach volley ball and other indoor games such as chess, checker etc.Can be requested at the front desk. Room Rates start from 1,700 to 7,000baht per night. Keereeta is created from a melange of contempory asian architecture which inspires comfort and relaxation. You can also relax in our herbal steam room. We invite you to experience the atmosphere of Keereeta Resort this will leave a lasting impression on you. 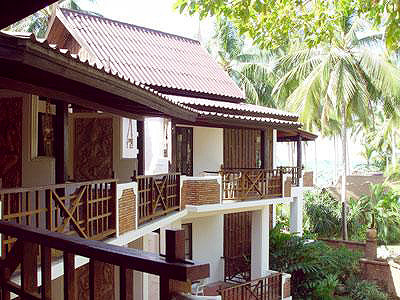 Keereeta resort is to be located at koh-chang ( Chang island ). It stands between Klong – Plao Beach and White Sand Beach it is about about 2 kilometer from White Sand Beach. Keereeta resort is 200 meters from the beach, some rooms have sea views. Room Rates start from 2,160 to 3,670baht per night. 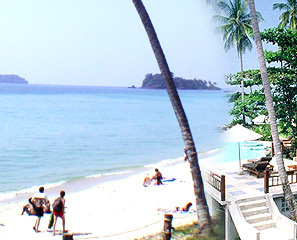 Koh Chang Kacha Resort is located in the center of the White Sand Beach. It is a beachfront resort with a great sea view and is a perfect place for those who love staying by the sea, with fine white sand and clear sea-water. The beach at Koh Chang Kacha Resort is ideal for sunbathing, swimming, playing or just lazing around. Late afternoon the beachfront attracts more people with some volleyball and football teams sweating it out on the wide beachfront. Room Rates start from 1,450 to 5,000baht per night. Koh Chang Lagoon Resort is a beach front hotel and bungalows with 63 rooms, Room Rates start from 2,200baht per night, they also have some 9 person rooms. 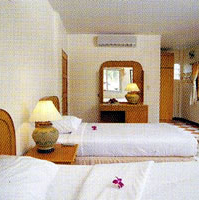 Has rooms from 1,600 to 4,900baht per night. PLALOMA CLIFF RESORT is situated at the southernmost and of Had Sai Khao (White Sand Beach) on the west coast of Koh-Chang. Set in a lush tropical garden that stretches out to the white sandy beach and expanding over a cliff, Plaloma Beach Resort offers a cosy atmosphere and a romantic ocean view. Plaloma Beach Resort is built to suit the tastes of individuals and families. Most of the resort is constructed from nature's material which are skillfully blended with the environment of flowers, palms and plenty of local plants as well as a mini zoo. Room Rates start from 1,250baht per night. 1,400 to 8,500baht per night. Room Rates around the 1,000baht per night range, but across the road from the beach. Beach huts available from 800baht per night. AANA meaning “Elephant” in Malayalam a native Indian language, is located at Klong Praow Beach on the picturesque island of Koh Chang in the Gulf of Thailand. Surrounded by lush green tropical forest covered mountains on one side, a river and sea on the other sides, AANA is set amongst the best nature has to offer. Room Rates from 3,500 to 13,000baht per night. Apart from taking advantage of the soft white sand beaches, more adventurous guests can enjoy hiking in the rainforests, elephant trekking, fishing, sailing, snorkling and diving. Day trips to the surrounding islands can easily be arranged and there are two multi-level waterfalls with refreshing pools to swim in. In addition after a day of activities, guests can enjoy sheer pampering at the Sivara Spa. Room Rates from 4,200 to 10,500baht per night. Our fisherman's house is built on concrete & wood stilts over the Klong Prao river estuary on the west coast of Koh Chang. At high tide water is underneath the house. The beach is around 2 minutes walk away through the coconut field at the back of the house - or 2 minutes paddle down to the mouth of the river. We have three, tastefully decorated, ensuite, airconditioned double rooms in the house. All of which open out onto a covered deck built out over the water. It is the only place to stay of it's type on the west coast of the island. But this isn't a place for party animals or for those in search of pampering. You will see that our neighbours are local families, some are fishermen, some are boat operators and some seem to spend the day doing nothing much at all except shouting across the river to each other and fishing. In the evening it's quiet. Very quiet. There are no bright lights, no bars and the only noise is usually the sound of the 'flicking shrimps - a type of shrimp that use their claws to communicate, you'll often hear the 'clicking' noise at night, you'll also hear cicadas, vocal frogs and the occasional canoe tour paddling past to see the nearby fireflies which inhabit the mangroves downstream. Room Rates 900baht per night. This boutique spa resort has 11 well-appointed bungalow units built mainly on wood with thatched roofs which give it a pleasant comfortable ambience. Refreshing aromatherapy products and unbleached cotton are appropriately provided in every bungalow. The aroma of herbs amidst the fresh air will make you feel revived spiritually and physically. Room Rates from 1,200 to 1,900baht per night. Located on Chai-Chet cape with breathtaking views of beautiful Klong Prao Beach, the azure Sea and the mountainouse Jungle Chai Chet Bungalows provides luxury, privacy and a friendly welcome to visitors to Koh Chang. We offer 57 rooms with air conditioning and 15 rooms with fan. There is a choice of beachside bungalows, our new hotel block, or hillside rooms with great views. We also have a conference room with facilities for up to 80 delegates. Additionally our noted restaurant offers fresh and delicious Thai & European seafood. Prices from 600 to 1,800baht per night. No website for this place but bungalows from 700 to 2,500baht per night. No website for this place but bungalows from 1,200 to 2,900baht per night. Has restaurant, swimming pool etc. Room Rates from 2,160 to 3,670baht per night. The newest resort in Klong Prao that’s easy on the budget and only about 400 meters to the Klong Prao beach. Its 20 bungalows are fully equipped with air conditioning, private bathrooms, cable television, refrigerator. You can choose from different rooms with king-size beds that can accommodate either 2 or 4 persons in a room. Its hillside location provides the best bay view of the Klong Prao Beach and the Chai Chet Cape. Bungalows are fully equipped with air conditioning, private bathrooms, cable television, refrigerator. Room Rates 1,200baht per night and up. Reputed to be the place closest to nature, Klong Prao Resort is a true hideaway enclosed in an elegantly laid out bungalow setting by a lagoon and the renowned Klong Prao Beach where you can enjoy a picturesque seascape and a spectacular sunset. Situated on the long, white and sandy beach are the reception, bar, dining area, minimart, dive center, changing / shower rooms, sundecks, and the newly open swimming pool, spa, sauna and jacuzzi. The lagoon itself is a beauty. Fishes abound and speedboats are anchored, ready to serve you anytime. The restaurant overlook the lagoon and serves a wide array of seafood, local and international dishes. Sea-kayaks, bicycles and motorcycles are available for rent at reasonable prices. There is also a 40-200 capacity conference room. 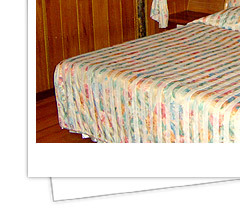 All the 114 cottage-style rooms are comfortably equipped with air-conditioners, television, hot/cold water and other amenities. Room Rates from 950 to 3,500baht per night. Located on the Eastern tip of Koh Chang Island, there is a very special place called Grand Cabana. Here a unique landscape fronts the secluded beach and ocean on one side and is surrounded by green hills on the other side. The large coconut grove planted generations ago, the secluded beach which had no name on any maps; all these until recently were some of the best kept secrets of Koh Chang. It is this unique environment that makes Grand Cabana Resort so exclusive and exotic. Grand Cabana Resort itself is situated on a hilltop, commanding panoramic views of the Gulf of Thailand with it's clear blue water and it's many small islands. The beach, unlike many other hotels, is well protected from rough seas during the monsoon period from April until October and therefore safe for swimming all year round. As an environmentally responsible hotel, Grand Cabana is committed to providing guests with a quality experience while maintaining policy of respect for nature and surroundings at the same time. At Grand Cabana Resort, almost every household at the local village is somehow represented or knows a relative working here. We think this is reflected in our warm and genuine service. At Grand Cabana Resort we offer superior rooms, villas and suites,Each room is facing the sea and has a large balcony. Grand Cabana Resort has recently opened a new wing. The new wing features 26 rooms that consist of 13 spacious superior family rooms and 13 superior rooms. Each room faces the sea and has a large balcony, individually controlled air-conditioning, satellite TV, radio with cassette player, IDD telephone, hair-dryer, mini bar, electronic safety box, bathroom with bath tub and integrated shower, and international standard fire alarm system. Room Rates from 2,300 to 4,000baht per night. Accommodations range from Standard to Superior Beachfront bungalow. 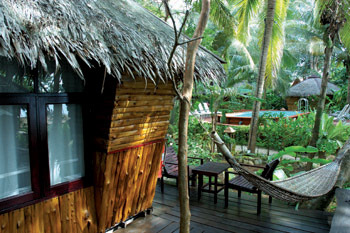 All bungalows are set among swaying palms trees and tropical gardens overlooking the beach. They are decorated in modern Thai style featuring air-conditioning, mini bar, refrigerator and cable TV. Room Rates from 4,130 to 8,600baht per night. Room Rates from 2,610 to 7,000baht per night. Thai Garden Hill Resort : The luxury new opened resort, surrounding by the peaceful of lush, Tropical plant life, and a seemingly endless wonderful environment of Koh Chang with the Thai - Bali style decor, Every guest room at Koh Chang Thai Garden Hill Resort is a suite, offering guests spacious accommodation that is homely and relaxing. Enjoy an exact deliciousness, refined extremely pleasing specification definess each choices of menu from our best chef both Thai and international cuisine. Room Rates from 1,000 to 1,800baht per night. Room Rates 3,250 to 6,850baht per night. Room Rates from 1,050 to 5,000baht per night. There The cluster of our residents - 50 Hanuman Deluxe, 12 Ravana Honeymoon Suite and 3 Rama Family - are tastefully designed for the sensual experience and also set with standard facilities as king size bed, private patio, lazy chair, individual controlled air-conditioning, hair dryer, satellite TV, hot/cold shower, in-room safety box, full set of amenity and toiletry, spa amenity, personal DVD player, welcome drink and fruit platter and tea/coffee making facilities. Room Rates from 1,950 to 7,100baht per night off of the internet, 5,000 to 12,000baht per night if direct booking. V.J. SPA service focus on individual treatment. Guest can indulge and easy away theircares with the various service including massage & aromatherapy , reflexology , body & facial treatment , herbal steam and Jacuzzi. Room Rates from 1,400 to 3,300baht per night. 84 Rooms, swimming pool, restaurant etc. Room Rates from 3,900 to 13,500baht per night. Swimming pool, restaurant, spa etc. Room Rates from 1,600 to 3,700baht per night if booked on the internet, or 2,900baht to 5,900baht if booked directly. Bang Bao Sea Hut is a new resort offering a unique holiday experience in the beautiful Bang Bao Bay. The resort’s luxurious wood-finished bungalows sit elegantly on a private pier over the water at the end of Bang Bao pier, and combine stunning views with the amazing sensation of living over the sea itself. Come and let us give you a holiday that you will never forget. The bungalows sit over the water, reflecting the traditional way of life of the fishermen’s village. The rooms are either air conditioned, or simply equipped with a fan for those who would prefer the cool sea breeze. Room Rates from 1,300 to 1,800baht per night. Room Rates from 4,500 to 20,000baht per night. Room Rates from 3,400 to 8,100baht per night. The RemArk-Pu-Zi Hut fronts onto the sea,natural stream. We provide electric fan,private toilet in all our Bamboo shacks, from 350 to 650baht per night. The tourist will enjoy scuba diving or snorkeling, sailing for fishing and traveling to see and get rest at koh kood ,koh mhak,etc. The tourist will enjoy having finest at various restaurant. ........Our beach is called Tha Nam beach or the more well-known name will be Lonely Beach make famous by travelers who commented in Lonely Planet as to be the best and most beautiful on Koh Chang. Room Rates from 1,800 to 4,700baht per night. Room Rates start from 500baht per night. Watch a beautiful sunset while enjoying a exotic cocktail made by Mr. Jack at our hotel's SWEET beach bar. Once the sun has descended behind the horizon, you can feast on the food from our straight-from-the-sea beach barbeque, or have our chef prepare some of the best Thai foods from our a la carte menu in the Siam Beach Resort restaurant. Some of our hotelguests even prefer to combine the freshly grilled sea food with some of the authentic Thai dishes from our hotel kitchen, which is an excellent choice! No wonder this hotel has been referred to as a true tropical paradise on Earth. 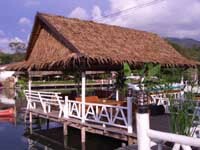 Chang Park Resort, Room Rates from 1,500baht to 5,600baht per night. All 33 suites are located along Kai Bae Beach, each with a separate air-conditioned bedroom, silent-running refrigerator, safe, and furnished veranda surrounded by tropical gardens. 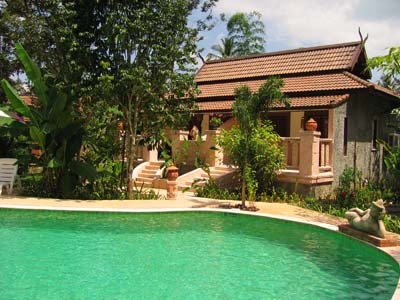 The Poolside Suites feature 16 standard unit of accomodation set in amongst a 15-acre coconut plantation. Each has its own private terrace and sun deck with lotus pond. The exotic views overlook five offshore islands, making these rooms particularly popular with professional photographers. Enjoy the total privacy and comfort of individual quarters in a lush setting of fragrant flowering trees. Room Rates from 2,600 to 11,600baht per night. 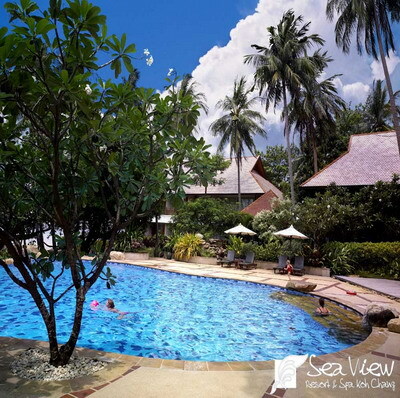 Amid the beautiful eastern sea, Sea View Resort & Spa Koh Chang, the resort for sea - lovers harmoniously blends modernity and convenience among peaceful shady lines of coconut trees and several kinds of local plants, along powdery white sand beach. Enjoy fresh seafood directly obtained from the sea, taste several kinds of famous fruit of Trat Province, tour with pleasure, take rest on small and large islands of the Koh Chang National Park. Spend your valuable time for a favorable vacation with our warm service created by us for your real - paradise at Sea View Resort Spa Koh Chang. Room Rates from 1,600baht per night. 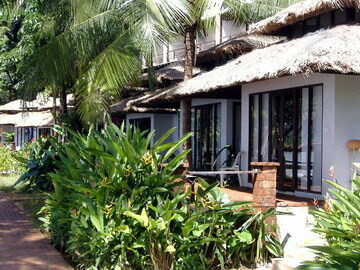 At the Siam Bay Resort on Kai Bae beach there are 4 types of rooms. Some of them have been popular for many years, others were build only a year and half ago. Especially the Baan Bon Nern family bungalows, which can accommodate a family with up to seven members and, of course, the luxury Baan Yong Yuth Buri beach bungalows are most popular with our guests from overseas. Many of our Thai guests, as well as quite a few of our guests from overseas, really appreciate the special all-in packages that we have on offer. 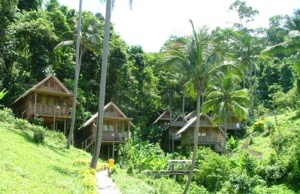 In these packages the bungalow's rent, a snorkeling trip to a nereby island and all meals are included. The Siam Bay Resort is located right next to the well know and, according to many of our walk-in customers, "slightly" overpriced Sea View Resort Koh Chang. Room Rates from 600 to 1,500baht per night. Room Rates from 1,200baht per night. Room Rates from 790baht per night. Thai restaurant with some western dishes available. They also arrange tours including snorkelling trips and eco tours. Koh Chang Marine National Park offers some of the most delightful dive & snorkeling sites. The best dive season starts from October / November to April. The best sites are on the west and south of Koh Chang where the abundance of brightly coloured, healthy and unspoiled corals and the great diversity of fish are the main draw. Popular sites include the Ao Klong Son, Koh Yuak, Koh Man Nai, Koh Man Nok, Hin Larp, Hin Sam Sao, Hin Look Bard, Hin Run Taek, Koh Rom, Koh Wai, Koh Ngam, Koh Rang, Koh Laoya, Koh Mai Si Lek, Koh Raet, Koh Mak, Koh Kham, Koh Rayang Yai, Koh Kra, Koh Thong Lang, Koh Thian, and Koh Yak. There are 2 wreck dive sites. The Koh Chang Wreck is a Thai warship sunken by the French Navy. The wreck lies in shallow waters near the Salak PetchBay, south of Koh Chang. The other ship wreck that has been making headlines recently is the Pak One Wreck (The vertical shipwreck). This was the 900-tonne sunken tanker that was called the Vertical Wreck. Pak One sank after hitting a coral reef in August 1996 on its way to Vietnam. It resurfaced on February 6 this year and drifted bow-upwards into international waters, where it poses a danger to passing ships. The Thai Navy had drained off its 600 tonnes of liquefied petroleum gas and re-sank it between Koh Chang and Koh Samet. It now lies horizontal, in 35-meter deep waters.